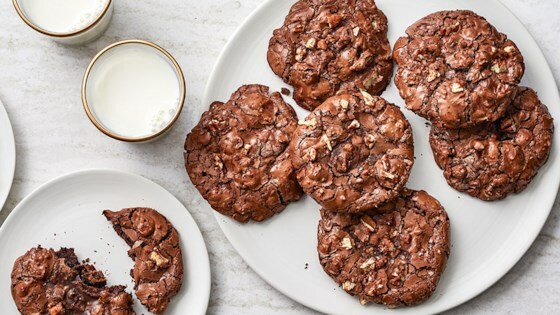 "Chocolate-forward with a nice crunch from pecans, these cookies boast two types of chocolate with a delightfully crisp outside and a rich, fudgy interior. Pro tip: Make sure to whisk the egg whites until they are very foamy--this gives the cookies the 'lift' they need." Place pecans in a single layer on a baking sheet, and bake in preheated oven until toasted and fragrant, 6 to 8 minutes, stirring halfway through. Let cool completely, about 20 minutes. Line 2 large baking sheets with parchment paper; lightly coat parchment with cooking spray. Sift together powdered sugar, Ghirardelli Premium Baking Cocoa, and salt in a large bowl. Whisk egg whites in a separate bowl until frothy, about 1 1/2 minutes. Stir egg whites and vanilla into powdered sugar mixture. Batter will be very thick. Stir in Ghirardelli Bittersweet Chocolate Chips and toasted pecans until well combined. Using a 1 1/2-inch cookie scoop (about 2 tablespoons), scoop dough, and place 3 inches apart on prepared baking sheets. Bake in preheated oven until tops are shiny and cracked, 8 to 10 minutes. Cool on baking sheet 5 minutes; transfer to wire racks and cool completely, about 15 minutes. I was pleased with this recipe and will make it again. It's crisp on the outside and moist on the inside. The entire family liked this new recipe! Batter. Much thicker than in video. These cookies were a hit with everyone!! I did add some chocolate nibs to the recipe and would absolutely make them again. Great recipe!